I was watching day-time television today and came across an interesting discussion on The Wright Stuff. 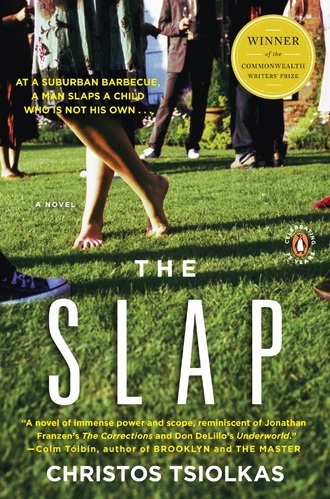 Matthew Wright and his panel were talking about the new BBC drama ‘The Slap’ (first episode tonight at 10pm), based on the novel by Australian author Christos Tsiolkas and discussed if it is alright to physically discipline a friend’s child. At a barbecue in suburban Melbourne Harry, self-made man and owner of several garages, slaps three year Hugo across the face. Hugo, has been misbehaving without any intervention by his parents, and Harry sees his slightly older son Rocco threatened by the boy. But were his actions right? 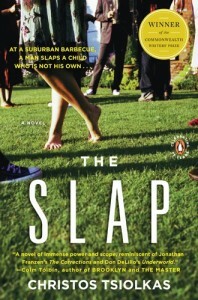 The slap sends the other characters “into a spiral, agonising and arguing over the notion that striking a child can ever be justified. Some believe a naughty boy should be taught some discipline, others maintain the police ought to be brought in to investigate a common assault” with a range of positions in between. For me the answer is a clear one: I would never slap someone else’s child, no matter how much they tried to provoke me. There are other ways and means to end a fight, especially if there are children as young as Hugo are involved. Three year olds can be removed from the situation. They can be distracted or if they are really aggressive, held back. Never should violence be a way to control a situation like the one described in Tsiolkas’ novel and would one of my friends resolve to physically disciplining my child, they would have been my friend for the longest of times. In fact, if I found out that someone had touched my daughter, I would absolutely lose it and take legal action. As a grown up person you should have enough self-control to deal with situations like that. You should understand that children push boundaries, that they test your patience and that they try to provoke you until your blood boils but never, never, never should they succeed at making you lose control. Oh no, I wanted to watch this!! Can't believe I missed it. For the record though, I don't agree with smacking so if I don't raise a hand to my own, there is no way I would raise a hand to someone else's! I would never slap someone else's child – I don't slap my own so wouldn't even dream of slapping someone else's! NO WAY! I would never slap my own so I wouldn’t dream of slapping someone else’s child! I think there are better ways to discipline children!